Like all our prior blog polls, this post takes a moment to memorialize the results we recieved on the most recent blog poll. 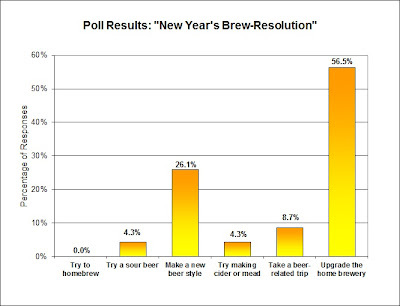 The readers' responses to the question "What Beer-Related New Year's Resolution Is Most Appealing To You?" are presented below. Bring on the new kettle, march pump, temp control, etc .... it seems everyone is looking to improve their homebreweries this coming year. I'll have to admit that I fell into this category too. With any homebrew mail order, I find myself always trying to add one or two items that will improve my process. Whether its an oxygenation kit, a diffusion stone, or a refractometer, I can never pick up just a few ingredients. However, as I mentioned in my 2011 wrap-up, my next homebrewery improvement needs to be a second chest freezer so I can keep beer on tap when I'm fermenting a new one. One of the categories I was hopeing to see get a bigger turn out was for "Take a beer-related trip", as this was a close second for me. I am sure most beernuts are like me and unconsciously do this anyways (heading to city X? What breweries/brewpubs/beer bars are there? 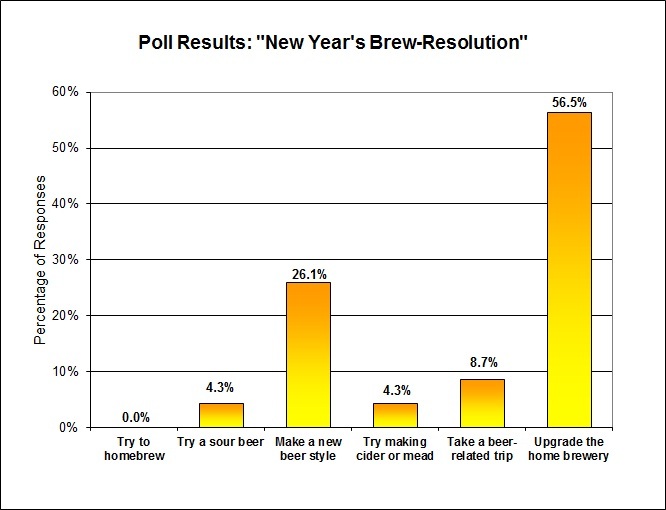 ), but taking a serious trip to beer-meccas like Belgium or Germany have always been on the short list. I've got to move that up on the priority list for sure. Let us know what your thoughts are on the topic. And if you are reading this, our next blog poll is up and awaiting your participation. "If God intended us to drink beer, He would have given us stomachs."